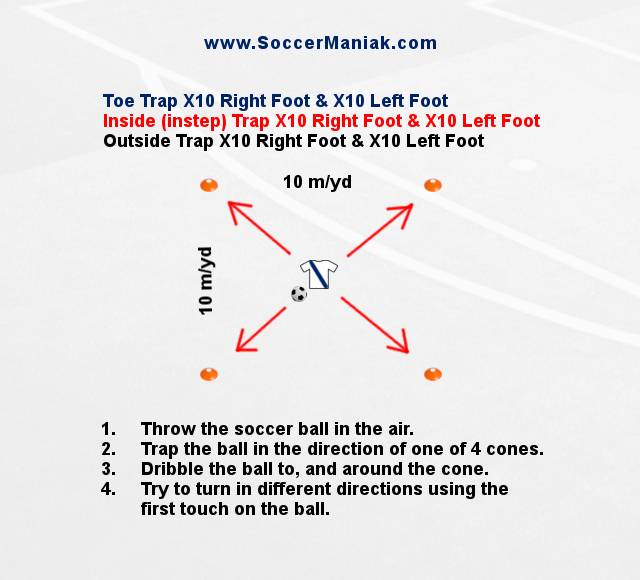 Soccer trapping drills are done in repetition to help player get more touches on the ball coming from the air. This soccer exercise is going to help players build coordination on the ball, and first touch to turn into space with the ball coming from the air. Set up 4 cones into a square 10 m/yd X 10 m/yd apart. Player will start in the center of the square. Throw, or kick the soccer ball in the air. Trap the ball using a specific part of the foot, or thigh, with the intention to keep the ball close. Use the cones around the square to trap the ball with the first touch towards one of the cones, dribbling the ball around that cone and bringing it back to the center of the square.